We already knew that working at one of Amazon’s warehouses could be hazardous. Amazon Robotics’ latest product could protect workers — but its existence is a strange vision of human-robot relations. TechCrunch reports that the online retail giant’s in-house design firm had to come up with a solution — in the form of a vest — to protect workers from warehouse robots. The vest sends signals to nearby robots telling them to slow down in order to avoid a collision. There have been a couple of incidents between robots and warehouse workers in the past. 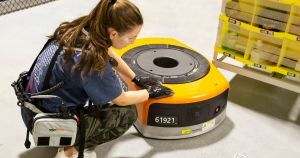 A robot malfunctioned in an Amazon warehouse in New Jersey back in December, tearing open a can of bear spray, and injuring dozens of workers in the vicinity. But safety advocates are paying attention. Last year, the National Council for Occupational Safety and Health put Amazon on its “dirty dozen” list of the most dangerous U.S.-based companies to work for, nothing that seven workers were killed at Amazon’s warehouses since 2013. It’s a gesture of goodwill for Amazon’s warehouse workers, but will it be enough to keep the robots at bay? Let’s hope we won’t find out the hard way.